Aloha! Welcome to the islands of Tahiti, Samoa, and Hawai‘i. Youre seated beneath an exotic 35 foot tall tree with 4,075 artificial leaves and colorful faux flowers that always bloom. Open your menu for a selection of dishes inspired by the South Pacific. Many people consider this to be the best food in the park. With your dinner, be sure to order a “Planters Punch Tahitian” in a tall cylindrical glass. Theres no rum in the punch, just a delicious blend of tropical fruit juices. The dinner was great. Now on with the show! The waterfall curtain parts. The band fills the warm evening air with island rhythms. With graceful hip and hand movements, the dancers give you a tour of Polynesia. To add to the authenticity, the dancers emerge from backstage wearing sarongs, grass skirts, or other traditional garments, as appropriate for each island. The lights dim for the daring barefoot firewalk and the thrilling fire-knife dance. Flames leap from water. Wow! The Tahitian Terrace opened in 1962 in the Adventureland section of Disneyland. For over 30 years, Disneyland guests enjoyed food and entertainment inspired by the islands of Polynesia. The restaurant and show operated during the summer and on busier weekends. There was always a line to get in. In 1993, Aladdins Oasis replaced the Tahitian Terrace. It must have seemed like a good business decision at the time, but Aladdins dinner show only lasted two seasons. The former Tahitian Terrace facility is no longer used as a dinner theater. If youre interested, you can look at a Tahitian Terrace Luncheon Menu. Photograph of the Tahitian Terrace dinner show (large): 1970 by Hal Schultz. 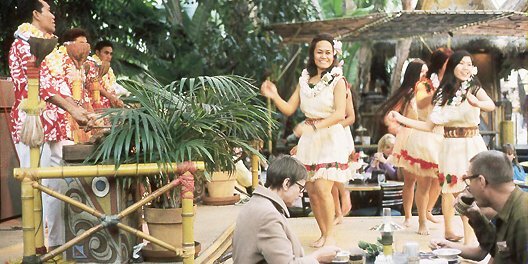 Photograph of the Tahitian Terrace dinner show (small): 1970 by Hal Schultz. Both photographs provided courtesy of Jason Schultz. The scanned menu art from the Tahitian Terrace Luncheon Menu is Copyright Walt Disney Productions (The Walt Disney Company) and is included here for historical illustration. The Tahitian Terrace Luncheon Menu was provided to Yesterland courtesy of L. Bowman.